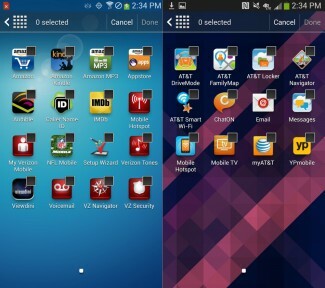 With the Verizon version of the Samsung Galaxy S4 (quick overview) now in hand, along with its step-brother on AT&T, we decided to take a look at the software each is running to see if there are any major differences. Since Samsung is now releasing one phone in one size on all carriers, with identical specs (at least in the U.S.), we don’t have to worry about comparing hardware. These devices are identical in physical form outside of a logo here or there. 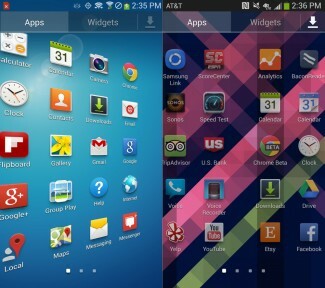 But software can certainly differ from one carrier to the next – we have seen that with the Note 2 and even Galaxy S3. So what’s different? Let’s look. The About screens won’t show any differences other than the model numbers and the slightly newer (by 2 days) kernel in the Verizon version of the device. 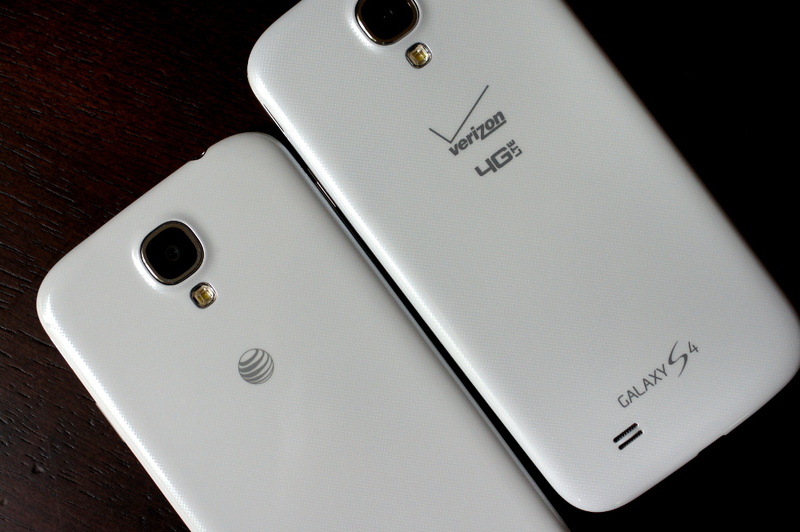 Each is still running Android 4.2.2 (JDQ39), however, Verizon has chosen to show the hardware version, while AT&T leaves that out. 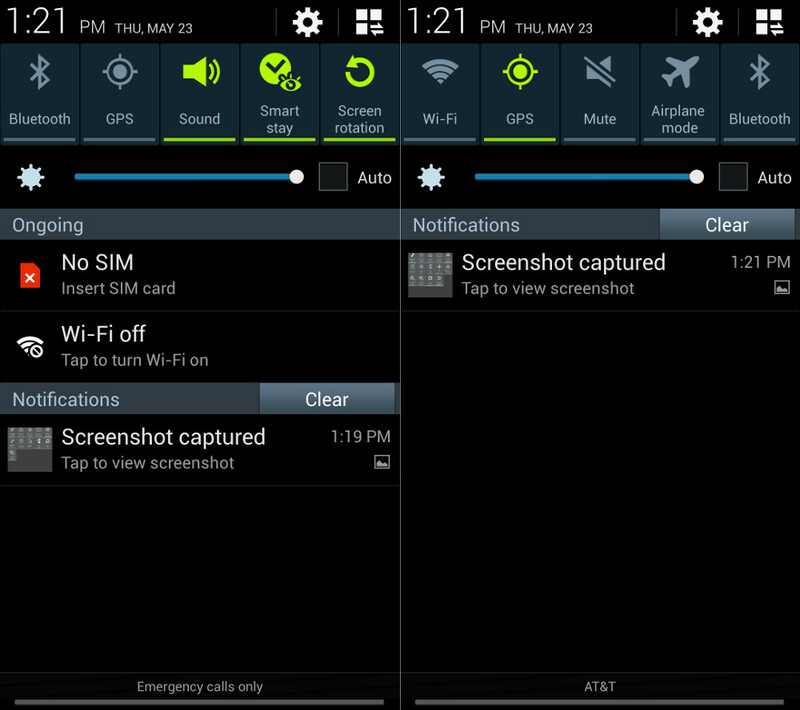 The notification panels on each will differ ever-so-slightly, and I’d argue for the worse on Verizon’s model. 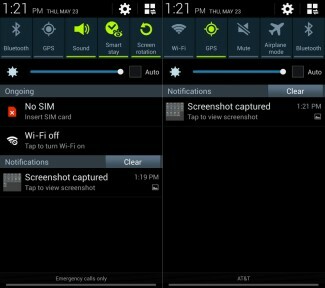 Just as they did with the Note 2 and Galaxy S3, Verizon has removed the WiFi toggle from the quick toggles section of the notification pulldown. Instead, they have placed an ongoing (non-removable) notification reminding you to turn WiFi on whenever you can. I still don’t know how this ongoing notification makes things any easier than a toggle at the top of the device would, but this is what Verizon has chosen to do. 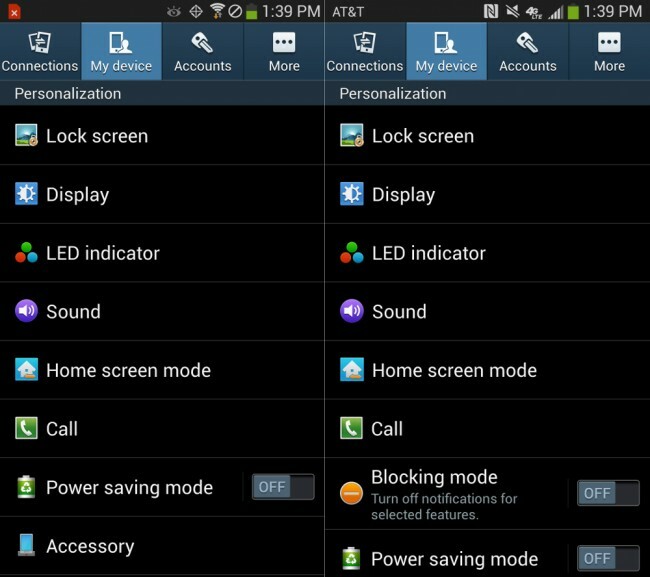 Also, if you flip over to the full list of toggles, you’ll notice that Big Red has removed a couple that are present on AT&T’s Galaxy S4. 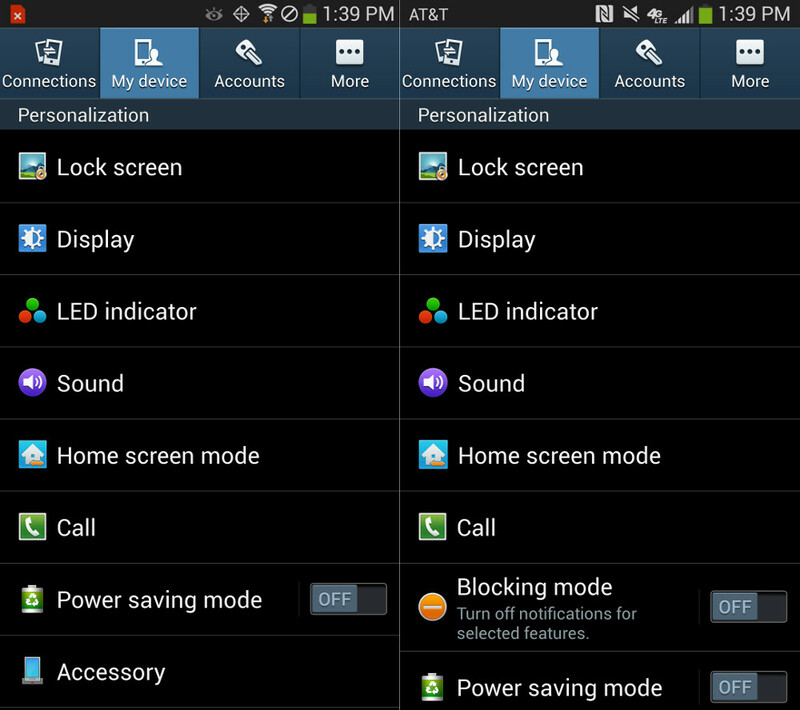 Toggles for Blocking Mode (we’ll get to this in a second), WiFi, and Air Gesture have all been removed. The first two make sense, but why on Earth they removed the toggle for Air Gesture is beyond me. Speaking of Blocking Mode, Verizon removed (or at least hid) it again from the GS4, just like they did with the Galaxy Note 2. This is another head scratcher, as Blocking Mode is a great feature that allows you to set your phone to disable calls, notifications, alarms, and the notification light during specific hours. When it comes to the bloatware battle, Verizon wins because they are now preloading their phones with the entire suite of Amazon apps. So thanks to those five coming pre-installed, they lay the smackdown on AT&T in terms of un-removable garbage that no one in this world wants to see installed on their phone. 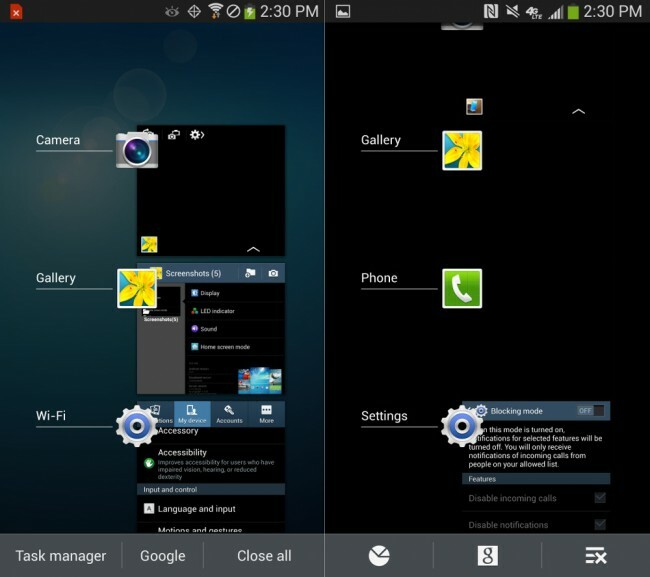 Some other things that you’ll notice being different have to do with the way the phone handles transitions. 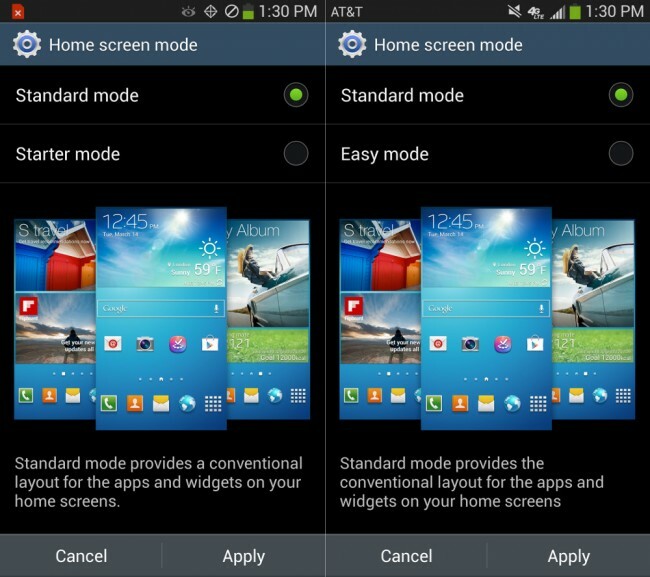 On the AT&T version (and all other versions to my knowledge), Samsung uses an infinite scroll, meaning whether or not you are on your home screen or in the app drawer, you can continue to swipe even as you approach the last page – you’ll simply return to the start or next home screen. 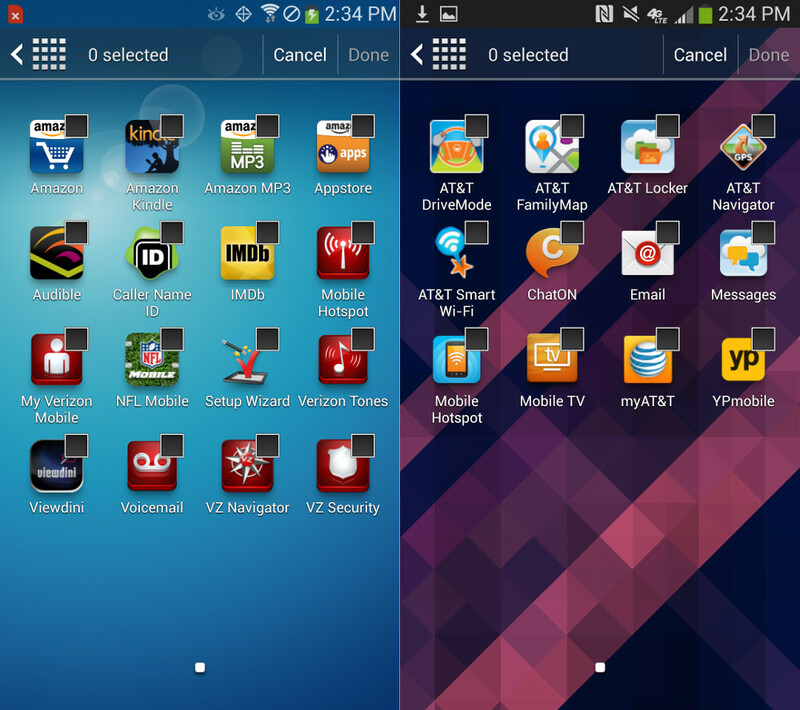 With the Verizon version, they have taken away the infinite scroll and instead stop you at the end of each app drawer or home screen. It’s a subtle difference, but something that stood out from the moment I fired up the phone. 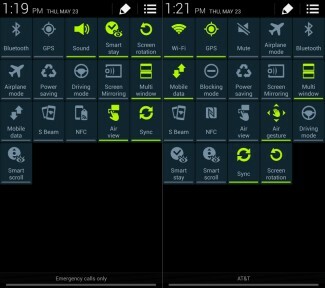 Throughout the device, you’ll see subtle text changes on buttons or in areas that the AT&T or international variants may not have. For example, if you long press on the Home button to get into the task switcher, you’ll see that the Verizon version displays text for “Task manager,” “Google,” and “Close all,” where as the AT&T version shows logos for each button. The other difference I was able to find was the name of the basic home screen mode on the phone. Samsung and every other carrier on the planet are calling it “Easy” mode, but Verizon went ahead and had it changed to “Starter” mode. There really seems to be no point to this change other than some marketing guy with a big title at Verizon HQ thinking “Starter” makes more sense to a new user than “Easy” does. The Verizon version does not have the Samsung Optical Reader app, Samsung Apps (store), or ChatON. 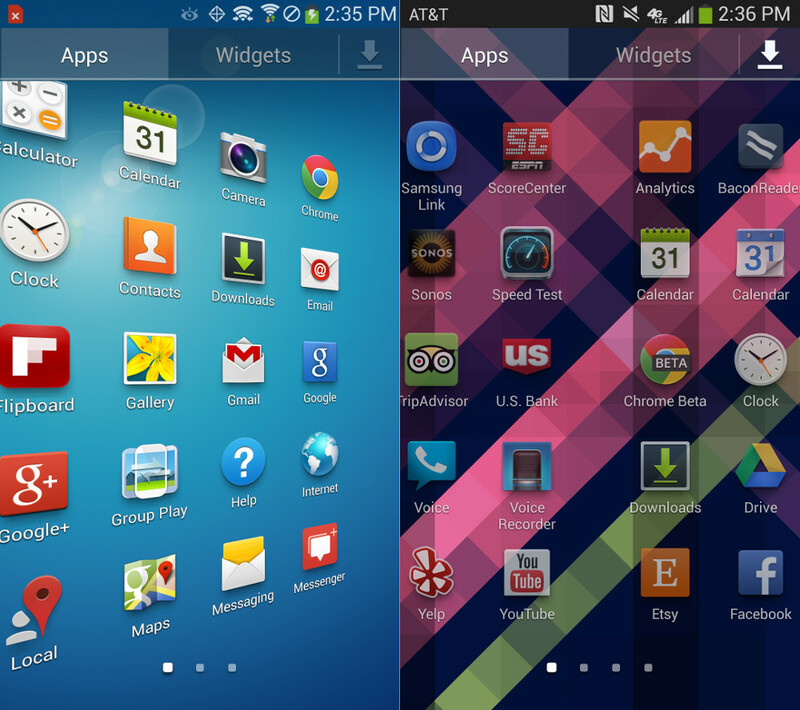 The rest of the Samsung apps appear to be there. 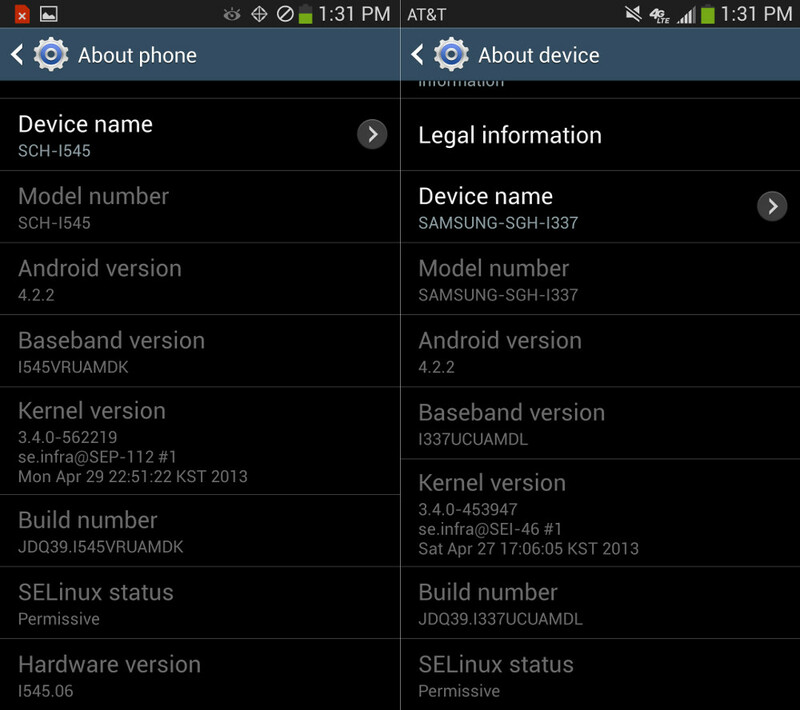 So outside of those minor changes, you won’t find many other differences between these two devices. 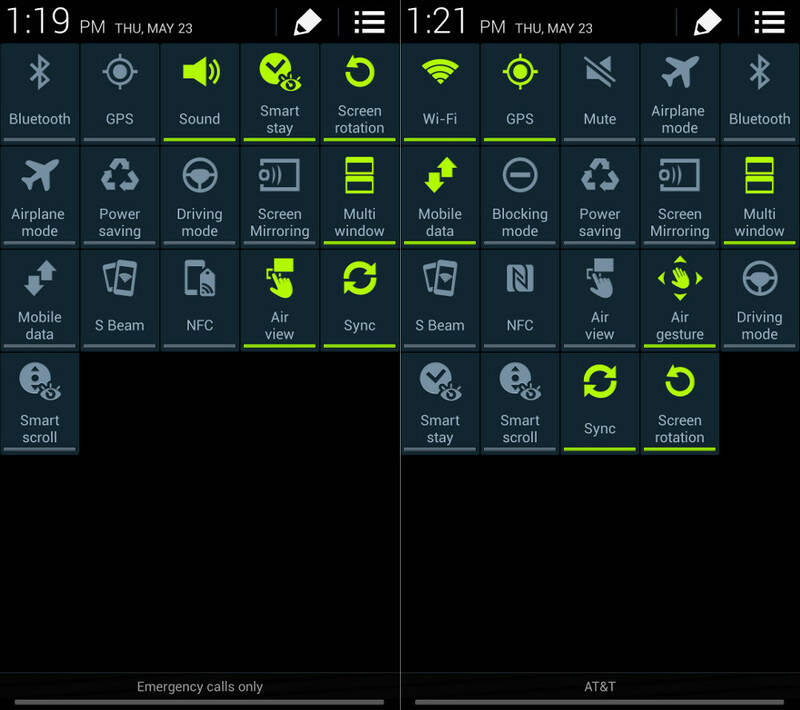 All of the gestures, Air View stuff, camera enhancements, and power are the same on both.